Iran is trying to exploit the visit US President Donald Trump to the military base of Ain al-Assad in western Iraq on December 26 to open a new front in the conflict of influence it waged against the United States of America, this time a legislative law is its field, and the tool is the Iraqi Council of Representatives. Tehran encourages its political allies who form a balance bloc in the Council to enact a law obliging the Baghdad government to end the US military presence on Iraqi territory. Undoubtedly, the departure of US forces remains a priority for the pro-Iranian political blocs in Iraq. Is this priority due to maintaining Iraq’s independence and not infringement on national sovereignty, or is the departure of these forces for the service of Iran’s geostrategic interests? The second possibility seems to be the closest to the proper political analysis. Trump’s visit to Iraq’s Ain al-Assad provided a golden opportunity for Iran and its supporters in Iraq to concentrate their efforts to avenge on President Trump’s position, impose sanctions on Iran, and create conditions that would expedite the US withdrawal from Iraq, the matter that will release Iran’s hand in Iraq fully and completely, and allow it to achieve its imperial project, by controlling the land extension from the borders of China to the Mediterranean Sea. A project threatened by the strong presence of the United States in Iraq, Syria and Afghanistan. Iran is therefore seeking to expel the United States from Iraq and Afghanistan, opening the way for its long-term strategic project, which is threatened by President Trump’s actions following the withdrawal of the United States from the nuclear 5 + 1 agreement with Iran. And then, one challenge remains to Iran, and its ambitious project, the liquidation or the domestication of the strong Sunni presence in the three central Iraqi provinces, namely Diyala, Baghdad and Anbar, a measure that could be carried out by allied militias in the absence of any actual US military presence on Iraqi soil, where any significant Political role for the United States will be lost. The presence of US forces in Iraq has confused Iran’s calculations in Iraq and the regional environment. The Iranians believe that the US strategy to expand US military influence in Iraq is so serious that it is difficult to confront. Observers of the political and military affairs in Iraq pointed out that the US Department of Defense adjusted the plans to withdraw from Syria, in line with emergency plans to promote the deployment in Iraq, explaining that the US withdrawal from Syria will not be completed, unless the arrangements to promote the deployment in Iraq are completed, and the USA has transferred heavy military equipments from Syria to sites in the province of Anbar in western Iraq, “asserting that the military reinforcements flow on the base of Ain al-Assad in this province, which is the largest gathering of US forces near the Syrian border. 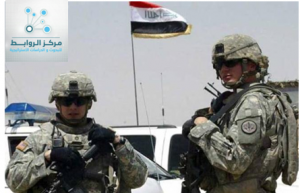 In addition, the US forces transferred equipment and weapons to military sites in the province of Salah al-Din in northwestern Iraq. Such moves would confuse the Iranian calculations in Iraq, as Tehran was counting on the benefit of the US withdrawal from Syria, but now faces a large US military deployment in Iraq. Iran’s ambition to remove the United States from its “path”, on which it is working to extend towards the Mediterranean, once a law passed by the Iraqi Council of Representatives seems unrealistic, because Trump’s visit to Iraq was not free of political and military messages, including: Iraq is still with its two parts , Arab and Kurdish , a major strategic importance of US strategic deployment in the Arab Mashreq. This American presence in Iraq represents a deterrent to Iran’s eventual acquisition over Iraq and an obstacle to the strategic deployment of the ambitious Iranian project to secure a presence from China’s borders to the Mediterranean. The significant US military presence in Iraq is a fact to sustain US influence on the final strategic directions of the Iraqi government. This presence is a great alternative, and it is highly reliable to sustain a strong American presence, whether in the event of an end to the American presence elsewhere, such as Ingerlik in Turkey, or many others in Qatar, for any reason. The US military presence is in support of US allies in the region, such as the Kurds, although the credibility of this support in a heated confrontation with potential enemies will remain governed only by US interests. It seems that Iran’s goal of ending the American military presence on Iraqi soil, in the defeat of Washington in the battle of military presence, fighting by itself or proxy , on Iraqi territory and the control roads linking Iraq, Syria and Lebanon, the endeavor seems to be utopian , as the new Iraqi government faces serious political, economic, social and security challenges and will be unable to open a new front against the United States after it has reached an exception from US sanctions on Iran in period of three months , the commitment to which would have posed a dilemma in providing gas and electrical energy. According to Iraqi observers, current Prime Minister Adil Abdul Mahdi does not think of changing the special position under which US forces are moving on Iraqi soil. Even if a decision is issued by the Iraqi Council of Representatives demanding the withdrawal of US troops from Iraq, the Prime Minister will not respond to that decision, because it was issued in the formula of a resolution and not a legal, and there is difference in the legal adaptation between them. The regional atmosphere is overcast. There is real concern about the Israeli raids on the Iraqi-Syrian border, Akashat, which targets Iranian forces and their allies, including the popular crowd, fearing that these raids will extend into Iraqi territory. Therefore, Adil Abdul Mahdi seeks to avoid serious repercussions of the Israeli raids t over the Iranian presence in Syria, as well as trying with every effort to maintain the balance between Washington and Tehran.